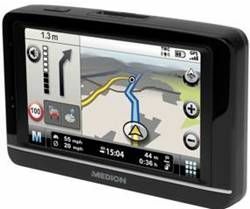 Medion has released its latest satnav, with the £139.99 GoPal E4230 aimed squarely at the 'budget conscious'. It's not the cheapest sat nav on the market by any stretch of the imagination, but it does have plenty of features pre-loaded, including cross-border Navteq mapping which covers 43 Western and Eastern European countries. All this is diplayed on a 4.3-inch display. Also impressive in the features list is the included 'traffic message' channel, so that you can be informed that the Blackwall Tunnel is jammed up for a change. Directions can be set to quickest, most direct or even most economical, and the device has cycling and walking routes as well with Berlitz guide points of interest in major European cities. As you may expect, the device will be available in Aldi stores across the UK from 14 May.